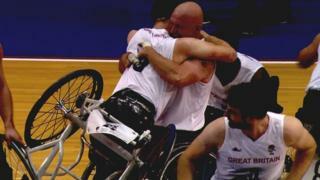 Watch the best shots as Great Britain's men's wheelchair basketball team retain their European title by beating Turkey 87-66 in Worcester. Terry Bywater top-scored with 29 points and was named Most Valuable Player, while Ian Sagar added 17. Earlier, the GB women secured their fifth European bronze medal in a row with a comfortable 69-39 win over France.